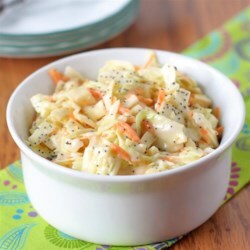 The BEST slaw recipe ever!! I just finished making it and YUM-O!!! Can't wait to try it in a few hours. It taste's just like the coleslaw at the fast food chicken place. The only change that I made was I substituted celery seed for the poppy seed. I didn't have bagged slaw mix, shredded a head of cabbage and a carrot. I just wanted to add that I have use allrecipes for a few years and this is the first time I have taken the time to rate a recipe, it's that good!! !